I write to you from the SeaJets Superjet, a high speed ferry that is currently in the middle of the Mediterranean Sea taking us to the island of Mykonos. We spent the last three days on Santorini; they were simply amazing. We flew from Athens Tuesday evening on a 25 minute flight on Aegean Air and were served chocolate covered baklava during the brief meal/drink service. Upon landing in Santorini we were picked up by our hotel shuttle for a short ride to Hotel Antonia in the town of Fira. Hotel Antonia is a beautiful family run hotel. Vasso, the owner, employs his family to run the place. Vasso’s nephew, Lucas, picked us up at the hotel and his son, Mario, was awaiting our arrival at the front desk. Mario first hands us two glasses of smooth, crisp, chilled white wine and proceeds to show us maps of the island and give us restaurant and beach recommendations. We finish the wine and Mario says “I give you a bottle to take to your room and keep in the fridge. If you run out, I bring you more. And if you finish that one, call me and I bring you more.” That phrase, “If you run out… I bring you more” has become a part of our lexicon now. We settle in our room and walk down the street to grab some food to go from a restaurant Mario recommended. The restaurant is a family shack with the daughter (Maria) running a very friendly front of the house with a menu full of her mama’s cooking. Mama is in the back putting out amazing food. We return to the room and finish that first bottle of wine with our dinner. The next morning I wake up early to “pick up” our rental car. The car was actually driven to us, parked in the hotel parking lot and all we had to do was meet the rental car staff in our hotel lobby. We’ve only been on the island 12 hours but are already loving the way things work… free wine, mama’s cooking, rental car delivered to your doorstep! 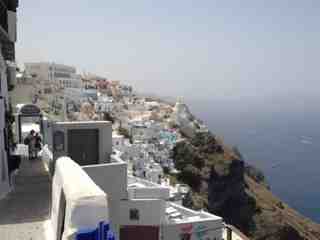 We walk a few blocks to downtown Fira for a “cliffside” lunch at yet another restaurant recommended by Mario. I say “cliffside” because Santorini is a volcanic island and we were actually sitting along the caldera (the edge of the volcanic crater). The volcano itself is 600 feet down below (underwater). We are sitting 500 feet above the water looking along the caldera at the terraced hotels, bars, restaurants and shops the sit beautifully (but precariously) along the rim. Lunch consisted of a Santorini salad (with locally grown sweet cherry tomatoes and caper leaves) as well as a sampling of spinach pie, tomato fritters (a local specialty), Santorini fava bean dip, dolma, and tadziki with olives while taking in the sites and watching the pack donkeys ferry tourists up and down the winding 588-step path to the old Port. After lunch we hop in the car and head to Ancient Akrotiri. Akrotiri is the Pompeii of Greece. It was the largest and most prosperous city on Santorini and in 17 BC was buried in volcanic ash after an eruption that wiped out all life on the island. It is still an active archeological site (since the 1960s) and is incredibly well preserved (three-story homes, pottery, a sewer system, wall-painted frescoes on which the color still remains). We “walked the streets” and imagined the life of the islands previous inhabitants. Our next stop (after getting lost driving around) was Perissa beach on the east coast of the island. This was a black sand beach (thanks to the volcano) situated next to a dormant part of the volcano. After soaking in some sun we returned to our hotel and found a full bottle of wine (thanks to Vasso) in our fridge. Kira and I finished it pool-side. Vasso comes by, sees our bottle is empty and returns with a third bottle. Quote of the day by Kira: “Man, I haven’t been this drunk since last night!” The wine is great and we ask Vasso where it comes from, it turns out he grows the grapes at his home and makes the wine himself to give to his friends, family, and hotel guests. Kira and I determine that this is the only place we’ll stay when we return to Santorini. We dedicate our second full day on Santorini to some quality beach time and wine tasting. We start our day off with visiting some of the famous blue-domed churches and then head to the grocery store for beach supplies: fruit, pistachios (another local produce), and chips (hot-dog flavored and ketchup-flavored). We drive to a remote black-sand beach near the airport on eastern side of the island. For three hours we soaked in sun, read, slept, ate and played in the waves to cool off. Despite living 1.5 miles from the ocean in San Francisco, I haven’t swam in the ocean in more than 10 years. The water is just too cold in the Bay Area. In the evening we stop by Santo Wines, a local winery perched on the caldera with great wine a great views. For 11 euros we get a flight of 6 wines, cheese, olives, tomato dip and bread to enjoy as we look out over the water. Santorini produces some really good white wines. However, don’t trust any reds that come from Santorini unless it’s Vinsanto, a port-like desert wine best enjoyed after a meal. We buy some Vinsanto to bring home. For our last meal on Santorini we go back and visit Maria and her family for some more of mama’s cooking. We get cheese stuffed peppers, an “eggplant saganaki” (another local specialty), baklava, and Marias home-made ice cream. We get two orders of meatballs in tomato sauce with rice to go for our ferry ride. The food was simply amazing and I’m changing my mind about eggplant thanks to Maria’s mama. Before the check arrives Maria brings out three shot glasses of desert wine; two for us and one for her to drink with us. We find out the wine is made by a local farmer with seven different grapes and he only sells to Maria’s family and another restaurant. It seems like everyone here makes their own wine. After dinner we wander the less populated pathways of Fira for some amazing views of the caldera lit up a night. We decide we’ll wake up early and come back for one final walk before leaving the island. “Amul! Amul! Wake up, its 10am!” The local church bell rang 10 times and woke Kira up. Good thing because we were to leave the hotel at 11am and I didn’t set an alarm thinking we’d wake up at 8am naturally as we had the last 5 days. We missed the chance for that final walk around town but we are not upset. We know we are going to come back and stay with Vasso and his family and eat with Maria and her family. So ends part 2 of our honeymoon. Part 3 start in about 1 hour when we pull into port in Mykonos. I just drank half a carafe of homemade wine poolside in Santorini. I’m feeling pretty good. Here’s some “best-of” from our few days in Athens. P.S. Ketchup-flavored Ruffles are AMAZING. Made it to beautiful Santorini. Olivia would enjoy being a Mediterranean island dog. Our first full day in Athens was a lot of fun. Great weather, wandered all around the Plaka region of the city. We’re slowly getting over jetlag, so we came back to the hotel a couple of times during the day for much-needed naps, but we ended up staying out till around midnight. In the morning, we wandered around Athens’ Central Market, which is full of vendors who sell produce, pickles and olives, nuts and legumes, fish, and meat. There were so many butcher’s stands! And apparently the aesthetic way to sell goat and lamb meat is to display the freshly-butchered skull, skinned, but with the eyes and eyelids still intact. We sampled some street food along the way, and then headed back to the hotel for a short breather. After lunch, we trekked up to the Acropolis and spent the afternoon walking around all the ruins, which were amazingly impressive. We were also entertained by some great tourist people-watching, and I took a bunch of pictures of all the stray cats and dogs that make the site their home. We made our way back down from the temples and enjoyed a teatime snack of cookie flavored gelato waffle cones (so much better than U.S. cookies n’ cream flavor!). We enjoyed a happy-hour half-liter (or litre since we’re here in the EU?) of Mythos beer (much better than last night’s FIX) and a plate of olives, and wended our way back home, quite tipsy. After another nap, we headed out again to find dinner, and Amul took us to a local restaurant he had found great reviews for. Definitely a good find, we ordered a Greek salad, moussaka, and “meatballs” with “baked potatoes” (which were actually flattened meatballs—more patty-like—and fries). All were fantastic. We had a stray cat come up to our table and beg scraps like a dog, but he apparently was rather snobbish, because he turned his nose up at the fry we offered him. I think he had his eye on the shrimp heads on the table next to ours. We wandered through the winding pedestrian alleys after dinner and ended up at the rooftop bar at the Hotel Central, which has a great view of the entire city. We enjoyed iced cappuccinos while admiring the acropolis lit up against the starry sky. Back in our hotel room now, we’re getting ready for bed after a busy and fun day. Tomorrow we’re planning on checking out the National Gardens, the original Olympic stadium, and possibly the Acropolis museum. Then it’s back to the airport to fly to Santorini tomorrow evening!